“Pinocchio” director discuss the Darlings’ daring kisses. Director: It was originally a bit sensuous, because they were pressed together too deeply, it would be disastrous, moms would stop the students from watching, so I remember I deleted some. Words on screen: During shooting, what is the most memorable nickname? KYK: I am Beom-ca Bong (In Korea, the stick holding a phone for taking selcas, is called Selca Bong). Because my arm is long, when we are having selcas, and I am the one holding (the phone) when we are taking group pics, so I am called that. Words on screen: Can you demonstrate the reporting scene you remember for us? LJS: I can’t remember anything… anything. Words on screen: How is the cooperation in acting? LJS: Very lovely, very very lovely, so… It’s true! Words on screen: All round capable ENT Lee Jong Suk whose can be model, actor, actor for dubbing? Director: Looking at the notes or books made by fans, I am so touched that I got tears in my eyes. Thank you. On-screen or off-screen, you just can’t tell. The Darling Couple: sweet as pies. Practice before the first snowy kiss. If these two will reunite in a new drama, I'm soooo cool!! Do Millet or In Style have plan to make some sort of mine-drama featuring these two??? 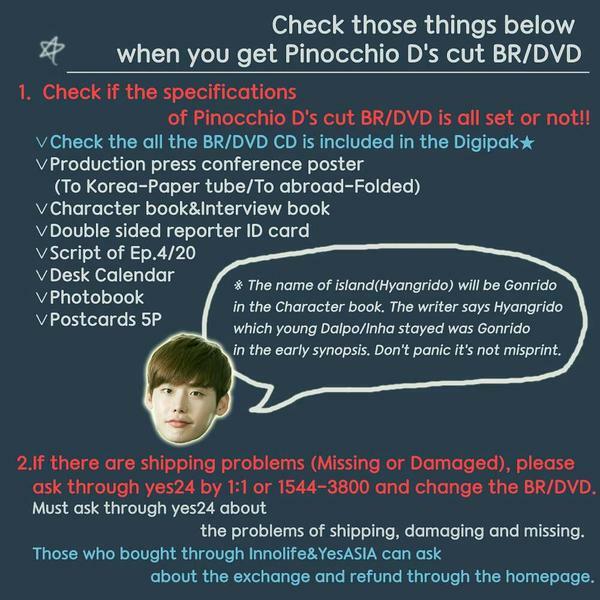 Hello I'm new here, I love darling couple so much and Pinocchio that I pre-order the Director's Cut on yesasia, but they change the release date from May 19, 2015 to July 7, 2015. I've seen few previews of the dvd, so anyone know why there is a sudden change of release date? I'm pretty sad because i thought I could have it soon. ​In fact the dvd release date is June 22 but it seems yesasia had problems with the supplier and they had to postpone the release date. I'm not sure about yesasia so please correct me if i'm wrong. Thank you very much for a warm welcome and replies! I was really dissapointed to find out that the release date is different and had to wait more days for me to finally have it. I was very much excited that I even pay for an express shipping so I could have it as soon as it was shipped, and I also already made a room for it on my shelf too bad I had to wait longer than I expected. Expected release date: July 7, 2015. “Pinocchio” was a drama with bad mothers and wonderful fathers—the latter group represented by the father-son duo of Gong Pil and Dal Pyung. Gong Pil and Dal Pyung’s family had its share of quirks, but it was also a warm, nurturing environment for Dal Po (Lee Jong Suk), Gong Pil’s adoptive son, and In Ha (Park Shin Hye), Dal Pyung’s daughter, to grow up in. These fathers truly believed in their children—even if gruff Dal Pyung couldn’t always show it. No matter what happened to Dal Po and In Ha, they could always come home at the end of the day and know that they were loved and supported. What else do you need from a father? My Father’s Day gift for Choi Gong Pil and Choi Dal Pyung: A pair of “World’s Best Dad” mugs. It’s a classic Father’s Day gift for a reason! The DVD set I ordered from Yesasia just arrived and it came with the preorder gifts but I ordered back in April so maybe you should email Yesasia to see if they still have the sets that include the gifts.